Now the question is whether it can keep him. The trophy is Joaquin "El Chapo" Guzman, head of the Sinaloa drug cartel. Mexican Marines arrested him February 22 in the port city of Mazatlan, in a beachfront condo -- reportedly without a shot fired. Within days, the calls to extradite Guzman to the United States reached a crescendo, and it's easy to see why. At least seven federal district courts have indicted him. The Sinaloa cartel has put its stamp firmly on major U.S. cities as distribution points: Los Angeles, Chicago and New York and San Diego. The cartel is estimated to be behind from 25 to 45 percent of the heroin, marijuana, cocaine and meth entering the U.S.
Guzman, too, is behind the deaths of countless young gang members slaughtered in infighting to maintain their street corner within the cartel's vast marketplace. Clearly, there is cause for extradition, and plenty of reasons why it would make practical sense. Foremost among them, argued the Dallas Morning News, is the historical corruption of Mexico's justice and penal systems. Slammed into a U.S. penitentiary, it's unlikely Guzman would be able to continue doing cartel business, giving orders from behind bars. Nor would it be as easy to bribe his way to an escape. Guzman's attorneys quickly moved to block extradition. They no doubt fear our federal prosecutors, who are well equipped to investigate and implicate far more characters within the Sinaloa network, uncovering its vast mechanisms for laundering money. Still, there is a strong argument in favor of prosecuting and jailing Guzman in Mexico: It has more to prove, and more to gain from bringing Guzman to justice. The benefits reach far beyond adding laurels to the administration of Mexican President Enrique Pena Nieto, on whose watch Guzman was finally captured. Or, rather, recaptured. He escaped from Mexican authorities in 2001, hiding in a laundry basket, likely through bribes. 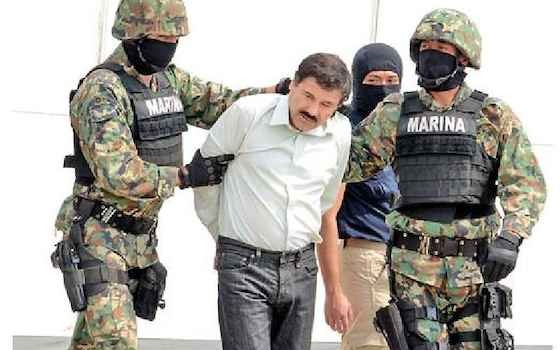 If Mexico can keep Guzman locked up this time and run him through its courts to conviction -- and that is a big "if" -- the gains to Mexico will be tremendous. Mexicans do not believe that their own government can keep him locked up. The Los Angeles Times reports that a survey done after the capture found that 69 percent of Mexicans think Guzman can escape again. And 70 percent believe he was able to stay free so long because federal officials were complicit. The cartels' damage to the country has been epic. At least 80,000, Mexicans have died or disappeared through drug-related violence since 2006. Killing escalated as cartels competed for turf, helping drive immigration to the U.S. and sapping Mexico of some of its most productive workers. Chasing down the cartels has been a running battle for Mexico. Much of the most gruesome violence began when the federal government mounted a war against the cartels and attempted to rid itself of corrupt police officials. Meanwhile, Guzman's reach became global. No surprise, then, that lore has built up around him. He is a favorite subject of narcocorridos, the folk ballads that relate the exploits of drug gangsters. The same romanticism was seen in the parades that were staged in Guzman's honor after his capture. People marched in his home state, Sinaloa, carrying signs pleading for his release. Fat chance he'll just be let go. While it was the Mexican Marines who nabbed Guzman, they did so with the intense cooperation of several U.S. law enforcement agencies. We're not going to let them drop the ball. Continued bilateral cooperation between the U.S. and Mexico is imperative going forward, for both countries. Nobody believes that taking out El Chapo solves the problem. Lieutenants with the nicknames "El Azul" and "Mayo" are predicted to take over for Guzman and may already be largely running the cartel. Guzman's legend in recent years may have eclipsed his actual role as Sinaloa's CEO. It's in our interest to let Mexico bring Guzman to justice. The U.S. only stands to gain as Mexico builds a stronger, fairer system of justice. Our nations are deeply, deeply entwined -- compadres in commerce, whether the import or export is crops, cars, human labor or drugs. Perhaps no better example exists of the relationship than North American's insatiable appetite for drugs, and the cartel's steady supply. "Trying 'El Chapo': Let's Let Mexico Handle This"